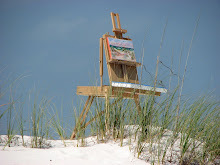 Plein Air Painting Journal: Now Leaving Florida - CONTINUE ?? Now Leaving Florida - CONTINUE ?? 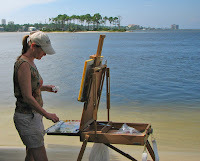 It was my turn to choose the location for our group - Plein Air Painters of Pensacola. The marker on the map shows my choice. I enjoy the boat traffic along the Intercoastal Waterway. Check out the ratio of water to land around here. Interesting thing on this map is the dotted line - as if you could divide the water that flows between Florida and Alabama. 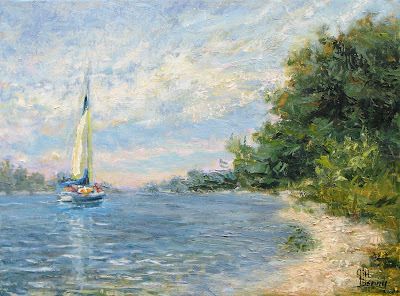 The boat in my painting is right at the tip of the state line. I realize things aren't drastically different on the other side, just call it state pride. This spot is a boat ramp and hang out for some local characters. One fisherman stopped by on his bike to point out the white pvc pipe cross, on the tiny island across the water where he buried his dog. Others seemingly ran their business from the picnic table. Enjoying the shore and few cold ones while simultaneously answering the cell phone as if they were in the office. Characters and all, I enjoy the local color here. I like working outside too! Just wonder what my NEW translation widget would do with a fabricated word like local yocal... ? "Florida State Line", SOLD, 12x16, Oil. NICE one Jill! I love your texture on this piece. Was it all all prima or did you go back into it? Great photo of the piece by the way. I'm jealous of your location. We have rain AGAIN and it is in the low 50s. I was outside a couple days last week; looks like maybe later this week we will get some sun again. So peaceful and beautiful, Jill. The water! It's been warm here for 2 days but going to 30 tonight. The map is a great idea, too. Yea, I often take liberties with my work long after the plein air excursion. You can click on the photo of the painting on location to see what it looked like when I left. I liked the trees - shape and variety of greens, so I was careful not to mess with them. I lightened the sand and added the boat from the photo taken while out. An awkward angle on the shore bothered me until I put that green spot of reflection down there. I was finally satisfied to sign, title, and blog it. How do I get that job on the park bench?! Great texture as always here! Very convenient to be able to leave out all the man-made junk that clutters the scene:) And, that boat was really necessary to balance everything out. You really picked one of the right year-round places to live for this kind of work. Beautiful. ooooh what wonderful sky and water. Thank you for letting us see your work at a comfortable size. Your painting has a very natural feeling. It's probably due to the colours and tones but when i look at it i feel really more in "Plein Air" than when i look at the companion photograph. Absolutely wonderful work. I do not always leave a comment but I browse through your blog on occasion and admire your talent to just get out there in the open and paint what you see. You make the scene look as we would want it to look at that particular time. To reply to your comment on my blog, no, that bird certainly was not hanging around Brooklyn, and neither was I! :) but close. . .
wow!the scene,the painting absolutelly gorgeous!